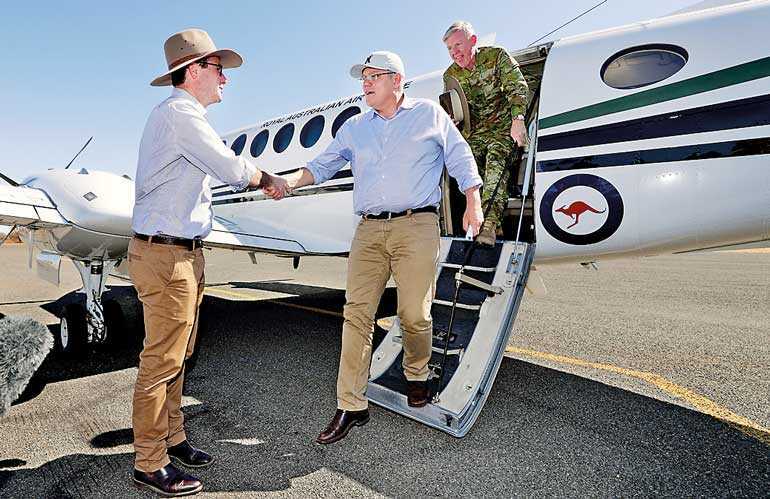 SYDNEY (Reuters): Australia’s new Prime Minister toured drought-hit farms on Monday to show voters after a week of turmoil the government was back to work, but a leading opinion poll showed it now faces an even greater chance of electoral defeat after changing leaders. Prime Minister Scott Morrison became Australia’s sixth leader in less than a decade on Friday after a faction of his Liberal party drove the ouster of Malcolm Turnbull but then failed to get its candidate elected leader. The ruling Liberal-National coalition’s primary vote dropped four points to 33 percent, a Newspoll showed, while the two-party-preferred split between the opposition Labor party and the coalition blew out from 51-49 in favour of Labor two weeks ago to 56-44, which would translate into a heavy election defeat. The Newspoll, published by The Australian newspaper, also showed Labor leader Bill Shorten was now preferred prime minister among voters. The next election is due by May 2019. Morrison, a Turnbull supporter, promised a new generation of leadership, and an end to political infighting. “Australians expect that of their parliament and I’m pleased that’s the case,” Morrison told reporters when asked about comments from former Prime Minister Tony Abbott, a leader of the conservative faction that ousted Turnbull, that the “era of the political assassin is over”. “The age of bitterness has come to a close, and the age of working together and focusing on the future has come,” Morrison said on his visit to Quilpie, a small outback town about 1,000 km (620 miles) west of Brisbane, capital of Queensland state. Morrison’s new cabinet included a number of ministers who were involved in Turnbull’s ouster, taken as a sign he was trying to unite the party. However, there was no ministerial role for Abbott, currently a backbencher. Among the reappointments was Home Affairs Minister Peter Dutton, who challenged Turnbull for the leadership last week. Morrison has a one-seat majority, but will face a by-election as Turnbull plans to leave parliament soon. A second by-election may be called if former foreign minister Julie Bishop, who lost her leadership bid last Friday, quits parliament before the next election. Voter anger at the leadership change lit up social media websites and newspaper letters pages on Monday, with some voters calling for an early election so they can decide who runs the country. “For the benefit of all Australians, and for the benefit of democracy, call an election, Mr Morrison,” wrote Ben J. on the Australian Broadcasting Corporation (ABC) news website. Donna C, also on the ABC website said that Morrison’s government had “just lost my vote”. “The demeaning of the office of PM has to stop. If your own party cannot respect the office, then how do you expect the Australian people to respect it?” she wrote.